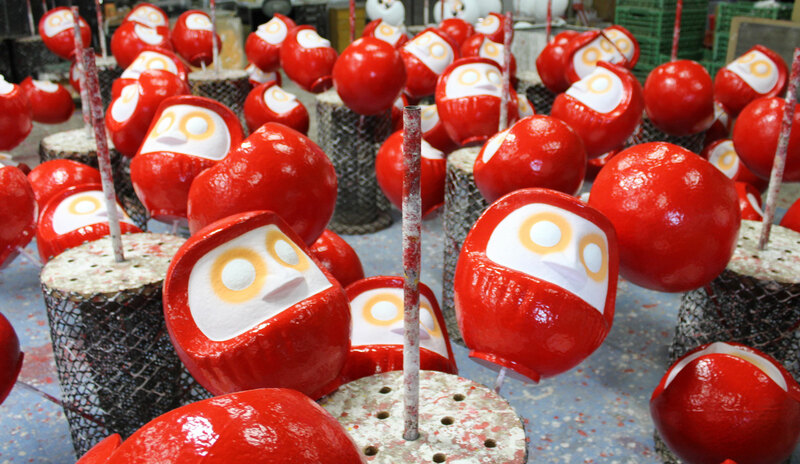 Traditional limbless papier mâché dolls called Daruma dolls are very popular Japanese good luck charms that represent perseverance, patience, protection, prosperity, achievement, and good luck in the New Year. 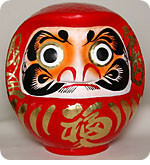 Classic Red Daruma Doll for luck and good fortune using skills and techniques cultivated in doll crafting. Painted with symbols of longevity - cranes for the eyebrows and tortoises for the mouth and beard - Daruma dolls are considered to bring good luck. One makes a wish when painting the left eye and when the wish is granted, the right eye is painted in. - Handgefertigte japanische Glücksbringer Daruma Doll. - Er besteht aus Pappmaché. Daruma gilt als Helfer bei der Erfüllung von Wünschen. Zunächst wird ein Auge des Glücksbringers ausgemalt und er an einen Ort gestellt, an dem man möglichst jeden Tag vorbeikommt. Ist der Wunsch in Erfüllung gegangen, wird das andere Auge ausgemalt. Auf den Darumafiguren stehen die japanischen Schriftzeichen Glück und Erfolg. Sizes, shapes and calligraphy fonts of the actual products may slightly differ. The color might be differ slightly from the actual product due to the monitor's display. The face of a Daruma is carefully painted with bold strokes by brush for beard and eyebrows. 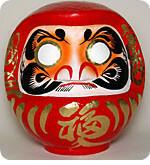 The multi-layered design of the Daruma holds many meanings. 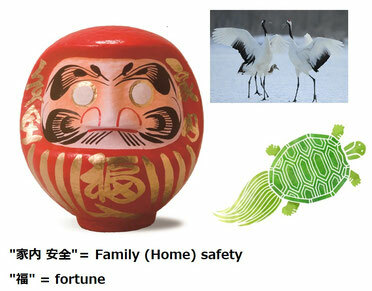 Eyebrows are in the form of a crane and a mustache are made to look like a tortoise, both represent longevity. The Red is the dominant color in most designs, because it’s believed that Bodhidharma wore red robes and because red is a very auspicious color in most Asian cultures signifying energy and good health. The artisan draws a good fortune message in calligraphic characters on the sides and the belly of the Daruma. So, he is the epitome of Good Luck Symbols and that is maybe why he sold so well to the Edo townspeople. The eyes of Daruma are blank when you receive at the beginning. 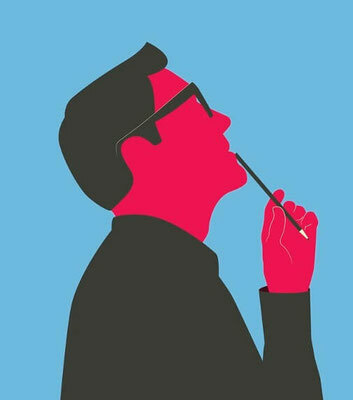 Make a wish or Set a specific goal for something like passing your next big exam. Draw one of Daruma's blank eyes to signify your commitment to achieving your goal. 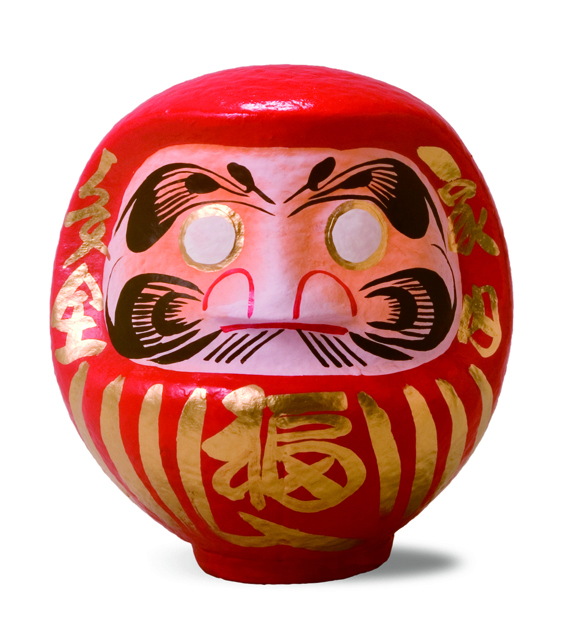 Place Daruma somewhere visible in your home so that while he focuses on your goal. You'll be reminded constantly to working on making your dreams come true. 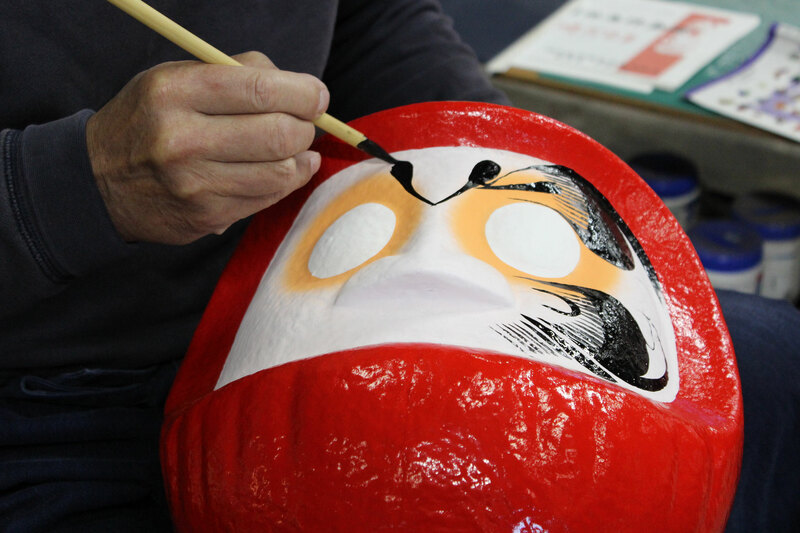 Once you've achieved your goal, draw in Daruma's other eye to say Daruma-san "thank you"! 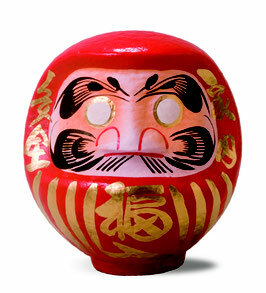 *Daruma is modeled after Bodhidharma, the founder of the Zen sect of Buddhism. Woodblock print by Yoshitoshi 1887. "だるま DARUMA" is a hollow, round, Japanese traditional amulet, tumbler doll modeled after 'Bodhidharma', the founder of Zen sect of Buddhism. 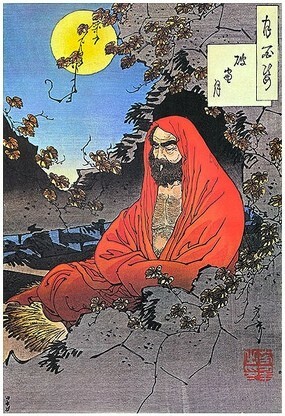 Bodhidharma was a Buddhist monk who lived during 5th/6th century AD. Legend claims that he sat facing a wall in meditation for a period of nine years without moving, which caused his legs to fall off from atrophy. Therefore Daruma doll doesn't have legs. 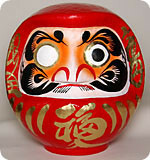 Nowadays "Daruma" is regarded more as a bringer of good luck. Daruma doll is weighted on the bottom, so it always recovers upright position whenever it is swinging. As such, It is a symbol of revival and "never giving up" to reaching the objective, as it always stands up positively. Initially, the doll has eyes without pupils. Oversized symmetrical round blank white eyes mean to keep track of goals or big tasks and motivate them to work of the finish. 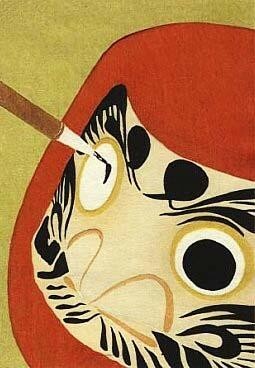 The owner of the doll fills in the left eye of the Daruma, upon setting the goal and makes a wish. And at later stage, add the right eye when and if the wish comes true. A few of hours northwest of Tokyo, in the city of Takasaki is famous for sight-seeing spots like the 41.8m tall Kannon statue and Lake Haruna, it is also the largest producer of Daruma dolls in Japan. 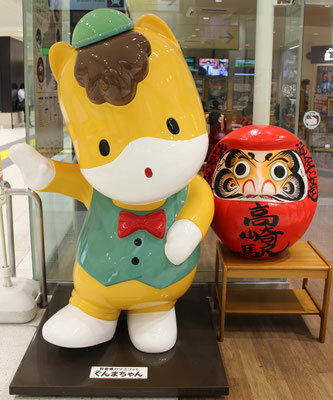 Arriving at Takasaki station, you can already see the prominence of the dolls in this area. Takasaki Daruma has a long history of 200 years. It first started out on a farm in Toyooka village and it spread to the neighboring Yawata areas. These days more than a hundred local farm families make almost two million of the dolls each year! 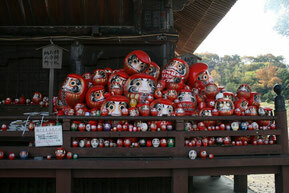 少林山 達磨寺 "Shorinzan Darumaji Temple" is the origin of "Takasaki Daruma" doll. The temple is constructed in 1697 and daruma dolls which completed its task for the past year are brought and piled up in the temple. The annual festival is held on 6 and 7 January, attracts more than 400,000 visitors for getting new daruma dolls.